Home > Essentials > Supermarkets: the Cheapest Loans on the Market? Supermarket loans regularly hit the top spot on loan comparison sites when it comes to the lowest annual percentage rates. Supermarket loans and credit card deals are competitive but are they cheapest on the market? 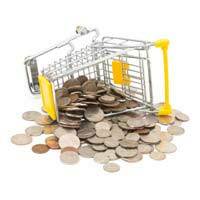 Supermarkets have branched out in recent years to provide a wide range of financial services. The big supermarkets now make it seem very easy to pick up a low cost loan or credit card along with the weekly shopping. Many customers are buying into the loyalty aspect of taking a credit card or loan from their favourite supermarket. But simply because a supermarket is an inexpensive way to buy groceries does not necessarily mean the same will apply for their financial products. Customers have recently rated supermarket credit cards higher than the traditional lenders. A recent survey of 10,000 customers placed credit services by Marks and Spencer and Tesco well above that of banks such as Halifax and Natwest. Customers claimed the supermarkets did give the best value for money and the best payment services compared to the traditional lenders. But around 34% of the customers surveyed claimed they didn't know how the annual percentage rate on their credit cards compared to that of other lenders. It does seem that supermarkets are winning in the competitive loan stakes. A £5,000 loan from Tesco over five years would mean a total repayment value of £6,147. The same loan taken with a traditional lender such as the Royal Bank of Scotland would mean repaying back £6,700 over five years. At a £553 difference between total payments the choice would be clear cut for most borrowers. Supermarket loans do seem to top the website loan comparison sites on a regular basis and seem more than worth considering if applying for a loan. Internet only loans are usually a good deal due to the lower overheads. But when compared with supermarket loans they are still trailing behind. Internet only banks such as Smile rank similarly in APR to the traditional banks. The difference in total repayments for a £5,000 loan between Smile and Tesco comes to just over £500. Some internet only banks are tightening up due to the economic climate. One of the most popular internet banks, Egg, has now withdrawn new loan applications. When it comes to credit cards there is not actually a huge difference between the supermarkets and the traditional lenders. Tesco lags slightly behind stores such as Marks and Spencer and Sainsburys in the APR stakes. Traditional banks such as Barclaycard are on a par with the supermarkets. But there can be a difference between lenders in terms of balance transfer interest rates and the length of time these rates will last for. The problem with many loans at the moment is that the banks and supermarkets are tightening up their lending requirements. Many lenders are withdrawing their unsecured lending services and are placing more importance on lending to the right customer. Website comparison sites are good for researching the best loans and credit cards deals. But the APR shown may not be the one offered once the application has been completed. Unless the customer meets all of the lending requirements a higher APR may be quoted, if the loan is even granted at all. There are number of lenders who are withdrawing specific loans. The withdrawal of products such as unsecured loans is happening with both supermarkets and high street banks. Supermarkets such as Asda have withdrawn loans altogether from their financial sector. Some lenders will now not offer new loans unless the borrower is an existing customer. Although supermarkets do top the charts when it comes to low APR loans these low rates or even the loans themselves may not last indefinitely. Supermarket loans do seem to offer very competitive interest rates, which is always good news for customers. But simply because these rates are advertised does not always guarantee that customers will receive them. Borrowers should always consider their current and previous credit records and existing debts before applying for any new loans.